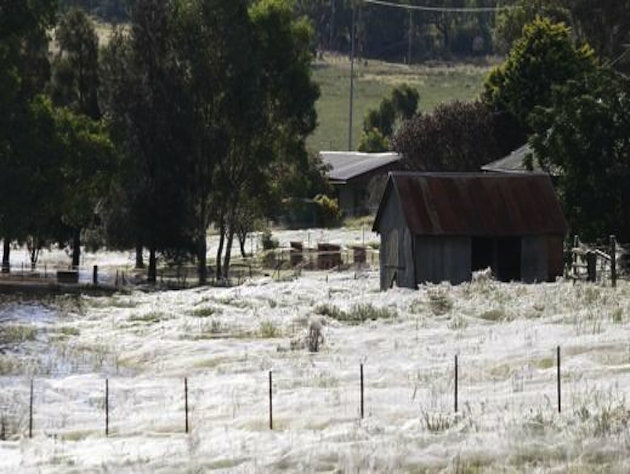 Thousands of spiders have made an farm in Wagga Wagga, New South Wales, Australia appear a million years old by covering it up with spider-web. Why would they do that ? Well, they were just escaping the flood. Thousands of normally solitary wolf spiders have blanketed an Australian farm after fleeing a rising flood. Reuters reports that the flooding has forced more than 8,000 Australian (human) residents from their homes in the city of Wagga Wagga in New South Wales. But for every temporarily displaced person, it appears several spiders have moved in to fill the void. The Australian Museum’s entomology collections manager Graham Milledge told Reuters that there’s even a term for the phenomenon, “ballooning,” and that it is typical behavior for spiders forced to escape rising waters. And it turns out the spiders are actually doing quite a bit of good while setting up shop above ground. The spiders are feasting on mosquitoes and other insect populations that have boomed with the increased moisture brought about by the rising waters. As amazing as this display may be, it’s not the first time photographers have captured massive displaced spider migrations. 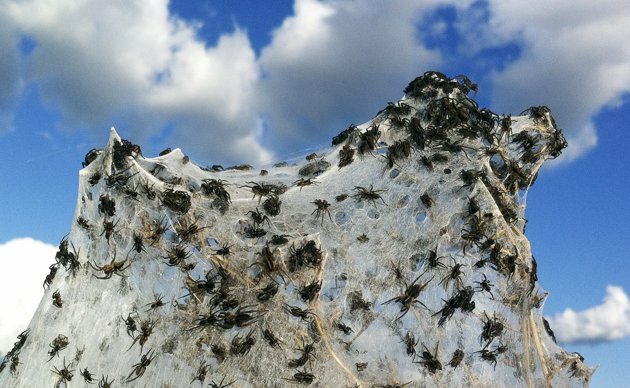 One of the most famous pictures of 2011, above, showed millions of spiders and other insects in Pakistan that had formed massive web clusters in trees to escape rising floodwaters.